The Federal Open Market Committee today lowered the Federal funds rate by fifty basis points to 3.0%. The move was as expected following the seventy-five basis point reduction last week. 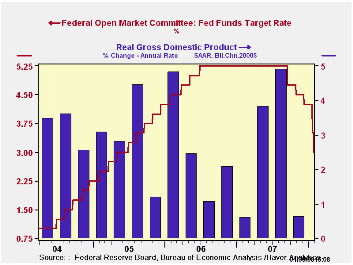 The rate was last at 3.0% in June of 2005. The discount rate also was reduced fifty basis points to 3.50%. The Fed indicated that "Financial markets remain under considerable stress, and credit has tightened further for some businesses and households. Moreover, recent information indicates a deepening of the housing contraction as well as some softening in labor markets." The Fed further indicated that "The Committee will continue to assess the effects of financial and other developments on economic prospects and will act in a timely manner as needed to address those risks." Voting against taking the action was Richard W. Fisher, President of the Federal Reserve Bank of Dallas, who preferred no change in the target for the federal funds rate at this meeting. For the complete text of the Fed's latest press release please follow this link. Credit Derivatives: An Overview from the Reserve Bank of Atlanta can be found here. Booms and Busts: The Case of Subprime Mortgages from the Federal Reserve Bank of Kansas City is available here.